Sincerely, thank you. Thank each and every one of you, whether you chipped in a few bucks, saddled me down with a generous pledge, or just spread the word of a cool-looking indie game to your friends...thank you!!! Well, you guys have voted (http://forums.ltheory.com/viewtopic.php?f=8&t=21)...and although it was a really close battle, Mac and Linux Support won out as the next stretch goal! 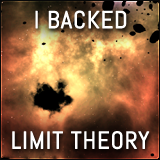 This means that, if we hit the mark, you can expect Limit Theory to come in Mac and Linux form. Unfortunately, this does not mean that the pre-alpha prototype will be available for other platforms. However, there is a good chance that the beta will be available! I've decided to release a few of the tracks that I composed for the LT soundtrack for free. For those who ordered the soundtrack, please don't worry, there's lots more that won't be released for free! You can listen to the soundtracks or download them via Soundcloud. And, finally, one of the tracks that you heard in the background while I was talking. This piece is something you might hear as you outfit your ship on a station or trade on a planet. It's not general space exploration music. In case you're interested, Brian over at SpaceGameJunkie has posted an interview that I did with him. 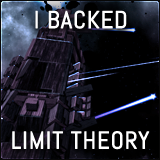 You can read it here: http://www.spacegamejunkie.com/featured/limit-theory-qa-limitless-procedural-good-timiness/. I'm also working on finishing an interview for RockPaperShotgun. Exciting! I tend to say that you should allow *ALL* of your stretch goals to be post-release, including the first one. 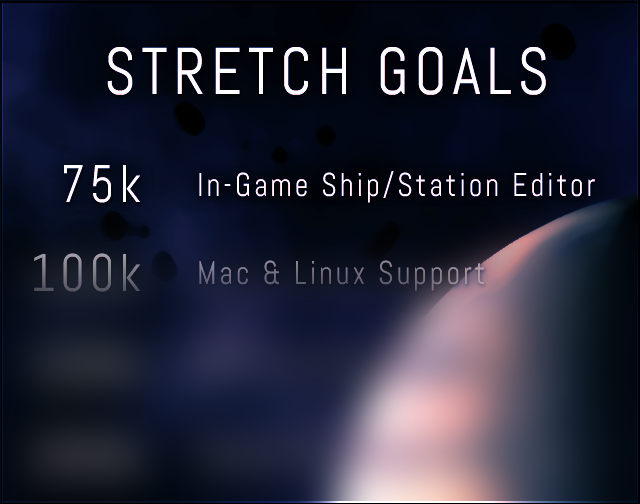 Mac and Linux support could very well be the hardest of all your stretch goals to implement, and while I'm sure that people might not exactly be happy about it, I'm sure they're happier to wait a bit than to not get it at all due to the amount of time sunk into porting eating away at your life. It also allows you to develop the add-on features in a more dynamic way, prioritizing those which are easier / faster to implement and putting the effort into the larger features when you have the time to spare. Fantastic that Linux support is the next goal! At least Mac / Linux support is an area where you could seek assistance on the technical aspects without impacting on the gameplay side of things. Hopefully by the time you get to it and if you're only targeting contemporary releases the OpenGL situation should be better. I am sure this was asked, and possibly mentioned previously, but I want to throw this out there. Will there be ways to mod stories and 'fixed' seeds into the game? I ask because it looks remarkably like what I envision a modern Homeworld game to look like, especially the first couple times the massive carriers were shown. Still loving the game regardless! Mac/Linux support is a great stretch to have. Particularly Mac, many people have switched over from PC to Mac in recent years and don't want to buy a PC for gaming (or give up disk space to dual-boot Windows). Giving these people an opportunity to play means they have a reason to pledge and it' a great way to boost this campaign. I'm really lookin forward to playing this on my Mac without having to boot into Windows (dual-boot already set up for other games, but I can only install 1 or 2 at a time before my Windows partition runs out of space). @Josh Again ....as USUAL a fantastic update. Love the music and the new buttons. Wow now I realy realy hope you don't overdo it for a single man developer. Maybe after the 100k Stretch you should add a stretch goal where you add a extra member to your team? That don't mean I'm unheapy about the Linux/Mac port as I'm not sure about what OS I will use after Win 7. @Lee - No, I wish I could do procedural music of that quality! That was just me, sadly. Pledged for GNU/Linux support. Thank you for this possibility. If I'm not mistaken, linux opengl drivers are quite 'special' to work with. I honestly think that being able to own a planet, and manage a fleet or create your own faction should be part of the core gameplay. Please dont make this a stretch goal. Lets be honest here, Your coding in OpenGL and i'm sure an easily portable language. Mac and Linux support is not going to be difficult or time consuming or further the game in any way, however the ability to own planets, systems, fleets, factions is to me the core aspect of this type of game. Glad to see the cross-platform made it as a stretch goal. Hope it makes it. Windows isn't the only operating system and its nice that game developers are starting to see that (I'm on Linux). I love that first track. on a lighter note, that track is just beautiful, I must have watched that first video about 10 times just because of he music. was that music Procedural as well? Embedded links are working for me. Sound great too! Thanks for loading. This one excites me a lot though - looking forward to a great 2013!! Well, either it's because I disabled the Java plug-in, or my install of Opera is seriously screwed. Either way, Surpassing the Limit in its original version is awesome! Downloaded the music using the e-mail links and really enjoyed the main theme. Shades of he oriental in there. Thanks Josh, really looking forward to the album. Knowing your passion for this project I am not concerned about stretch goals. The Soundcloud widgets work on my iPad 2 and in Opera (Win7). Congrats, Josh, and thanks for the music. I'm very much looking forward to the rest of the OST. PS: I think if you don't have flash installed the soundcloud widget doesn't show up. @Netzbummler - Weird...can anyone else confirm that the SC links are missing!? Sorry, am I missing something or are the soundcloud links nowhere to be seen? I really hope that the Mac&Linux stretch happens. Would be nice to have a game like this on those platforms. Of course I am disappointed that the vote swung in favour of cross platform support but at the same time, if I owned a Mac or Linux machine, I would definitely want this as a game I can play so I am glad for all those people who can possibly (if we reach the goal!) share in the experience at launch as well..